Not all spiders are arachnophobic! They have much more reason to be scared of spiders than people do, though. Most of them are solitary, and only tolerate the presence of others when it's time to mate. Even then, females often eat the males when they're done, because when a male spider is done, he really is done. 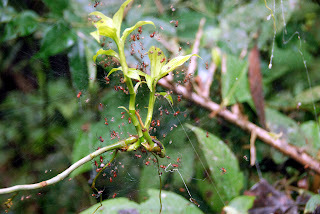 She'll then lay a great bundle of eggs which hatch into a cacophony of tiny spiderlings. 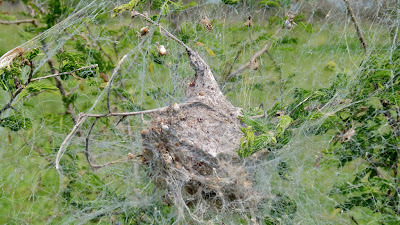 It's a big ball of spiders who want nothing more than to get away from all those horrible little spiders crawling all over them. It's like the poor blighters' first glimpse of life is the bright colours of overexcited evil known as the Japanese Game Show. But they're not all like that. 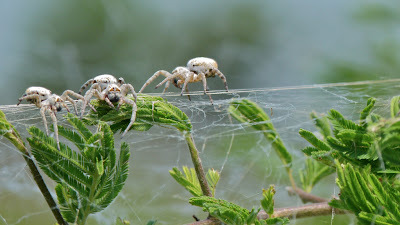 In some species the spiderlings will stick around, build a large web together and only take to the lonesome life when they start to reach adulthood. Some take it even further and live together for their whole life. Some species create complicated nests, full of tunnels and passages in which they rest like monsters in a disused mine. 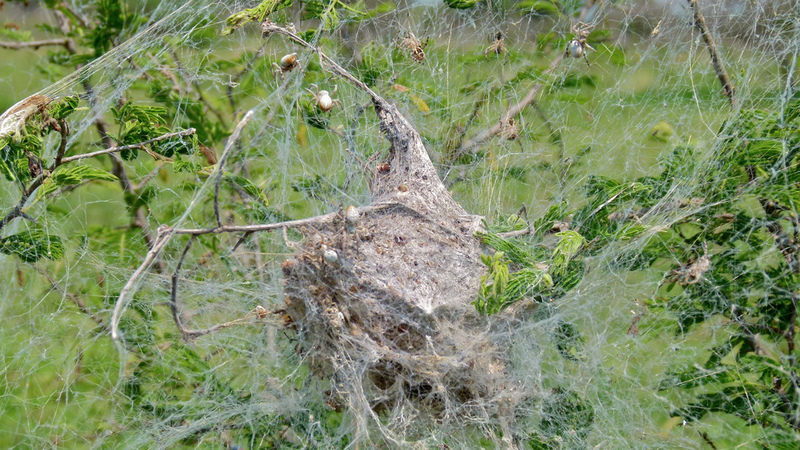 Beyond the retreat are the sticky webs for capturing prey. There's one species which can have as many as 50,000 members in a colony! 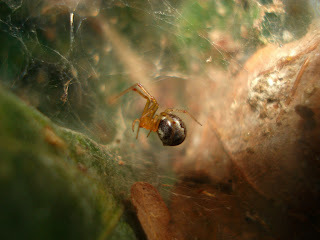 Social spiders are tiny, but when several hundred of them descend on prey like miniature, poisonous wolves with 8 legs... Someone is in trouble, dear reader. Someone is in trouble. There are 23 species of social spider in all, found all over the tropics. They are not all related to each other - some of them are the only social species in their genus - and the level of social behaviour varies widely. Some of them are only social in certain parts of the year and some may be social in one habitat and solitary in another. Some social spiders aren't very social at all. 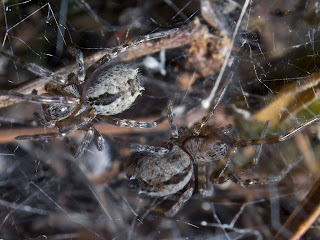 They each have their own web which is loosely connected to all the others. They don't help each other out and the worst thing would be if the next door neighbour invited one over for lunch. That'd mean you owe them something. How dare they! Basically, it's a big city. A big spider city. Imposing yourself on your neighbour as if you have something in common other than apparently being of the same species is terribly rude. Others take it several steps further and are close to making arachnophobia a rational, evidence-based assessment of risk. Which I guess would stop it from being a phobia. I mean, no-one has speeding-vehicle-phobia or raging-inferno-phobia. You have button-phobia, instead. Better known as koumpounophobia. Such is the way of phobias. The most social of social spiders have one female who is the only one allowed to lay eggs. All the other males and females look after the web, kill whatever falls into the web and feed the young by regurgitating a nightmarish slurry of baby food. They're almost eusocial, like ants and bees, except the other females aren't actually sterile. The reproductive female is the biggest in the colony, using her physical dominance to acquire the best prey, lay lots of eggs and slaughter puny males in great abundance once their usefulness is at an end. It's a little terrifying; one has to wonder what feats spiders may be capable of when they work together. 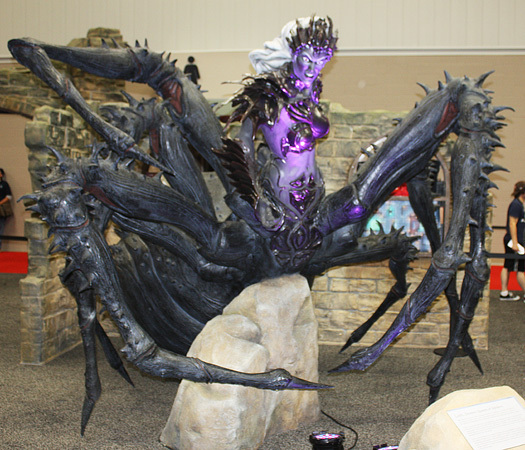 What if colony fought against colony and one massive female rose from the burning venom and shards of silk to become the Queen of Spiders? And all the other spiders obeyed her evil command? And they really were more frightened of humans than we are of them, but in an evil "well then let's kill them all" sort of way. What then? "I told you so", said the arachnophobe. Never gave much thought to the anti-social disorganized nature of spiders...I think I like them better that way. okay, solitary ones i can deal with. massive colonies of them? no thanks! @TJ: Yeh, you don't notice a good thing until it's gone. @TexWisGirl: I know, it's a scary prospect! That is enough to give me a nightmare tonight! What a terrible death for that cricket! Amazing how they all work together for the good of the colony! I agree! I just can't help but admire the terrifying horror of it all! Haha! Good point. Well made. Yup! One day they will be our lords and kings. 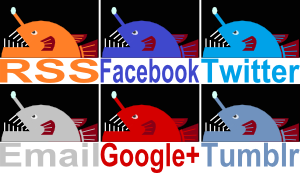 Vampire Squid Feeds on Filth! Killing you softly. And slowly. And horribly.